Last day to register is Friday, March 22. Get your tickets today. 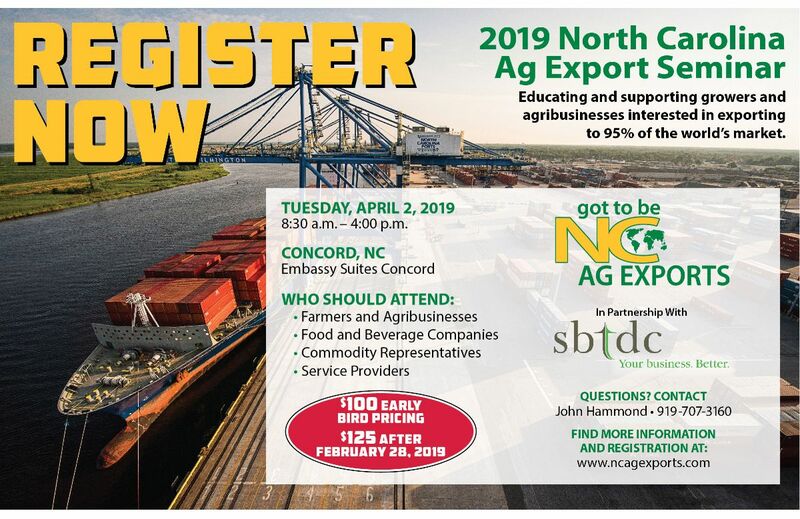 You are invited to join the North Carolina Department of Agriculture and Consumer Services and the Small Business and Technology Development Center as we host the 2019 North Carolina Agriculture Export Seminar. This year’s program will be held at the Embassy Suites in Concord, NC on April 2, 2019. Topics for discussion will include Why Go Global, How to Find International Partners, Legal Considerations for Exporters and Trade Finance Options. We hope you can join us for this great opportunity to learn more about expanding your business.